CODRINGTON, Barbuda, Nov 30 2012 (IPS) - Local scientists are warning the tiny 62-square-mile island of Barbuda is becoming one of the most vulnerable spots on earth to the consequences of climate change. “We are small, we are flat…and if the climate change predictions come true, especially with respect to sea level rise, you are looking at potentially a third of the island being not available for the sort of things we are using it for right now,” marine biologist John Mussington told IPS. 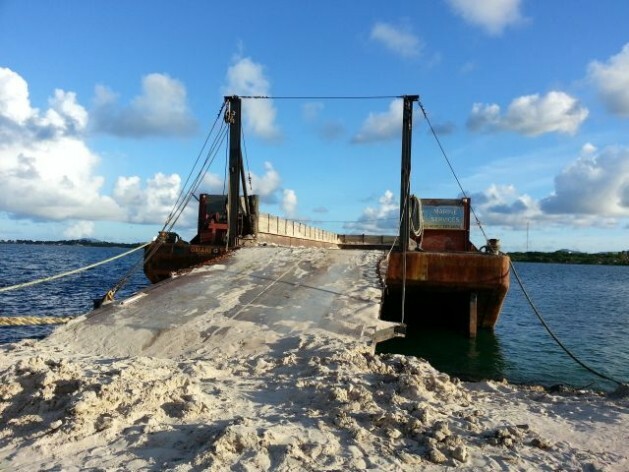 Worsening the problem is the long-time practice of sand removal from the island, he says. “You have land, sand and water, and when you take sand out of the system, sand will move from somewhere else to replace that which is moved. So the amount of sand which has been taken out of Barbuda over the years has impacted our shoreline. “We already have accelerated erosion taking place because of the sea level rise, and added to that you are taking sand out of the system so what you find happening, that beautiful beach that stretches all the way from the north come around to the south, most of those areas where 10 years ago you had grape trees and coconut trees, they are just not there anymore and you are actually seeing the collapse of the vegetation into the water,” he added. In July 2011, Barbuda renamed a three-mile stretch of beach after the late Princess Diana of Wales, who was a frequent visitor. Mussington says the island could well lose that very beach, along with others that attract tourists and boost economic growth. “You experience the sea level rise which is being predicted, and one of the ways in which the shoreline responds to that is that the shoreline will move so the beaches will recede closer to the solid land,” he told IPS. Dr. Brian Cooper, who heads the Antigua and Barbuda Environmental Awareness Group (EAG), said both islands have been experiencing their share of extreme weather conditions – one of the consequences predicted by climate change scientists. Dr. Cooper told IPS extremes of weather inflict human trauma, cause economic damage and destabilise agriculture. “We need first of all to look at our agriculture and our food supply, because the way the world is going, the way the population is increasing, and if these predictions about climate change come about, a lot of the world’s food-producing areas are probably going to be affected,” he said. Dr. Cooper also said the country needs look at the water supply for agriculture because if droughts are going to be serious and prolonged, this would affect food production. “We have desalination but the cost of desalinated water is really not amenable to wide-scale use for agriculture and we’ve done very little to look at increasing our other sources of surface water or ground water, and ground water itself is likely to be affected by rising sea levels because all our well-fed areas are very close to the coast,” he said. He pointed to recent floods in Russia and Pakistan, and weather extremes in the United States and Canada as clear evidence that climate change is real and happening now. “It’s really falling in line very much with what was predicted…we get extremes of weather anyway, things go in cycles, you have various climatic cycles coming together and giving you exceptional weather conditions, but all those things are exacerbated by the increase in CO2 in the atmosphere, at least that is what the climate change scientists are more or less unanimously agreed on,” Cooper said. Dale Destin, a climatologist at the Antigua and Barbuda Meteorological Service, told IPS that over the past two years, the country saw a period of wet conditions that has now transitioned into what may become a mild drought. “These things would generally happen in cycles but with climate change some of these observations become more extreme,” he said. Mussington said despite the grim predictions, climate change need not be a death sentence, adding that Small Island Developing States like Antigua and Barbuda have to adapt. However, he laments that the adaptation issue is not being taken seriously and is absent from policies governing certain critical areas. “Do we have a policy on agriculture?” he asked. “Do we have a policy on tourism which takes into consideration what is predicted to happen? “So, for example, tourism they say is where our economy benefits the most from, so if you know that climate change is happening, the common sense thing is that you should have a policy in place as of yesterday to say that ‘okay, we expect that our coastline is going to be most severely impacted so that any existing hotels we can’t do anything about but future development should be done away from the shoreline’,” he said. “We are not hearing that yet. You look at the same thing in agriculture; you are going to have a lot more of your coastal areas being salinated. “We need to apply crops that can withstand the higher temperate and higher salinity and so on – these are the things we need to put into our policies and start implementing them now and if we don’t we are basically just running to the cliff and jumping off blindly,” he warned.